Adelaide Wilson and her family are going to the summer house for a weekend of sun in Santa Cruz. Unfortunately the trip does not come without some emotional baggage. When Adelaide was just a girl she experienced a traumatic incident when she wandered off while at the boardwalk with her parents. The memory of that night has haunted her since and the nightmare may not be over. That first night another family appears at the end of the driveway to their home, dressed in red jumpsuits, together in silence. No sooner has Adelaide’s husband, Gabe, stepped up to scare them off and they are breaking into the home and terrorizing the Wilsons. Their worst fear in being realized. They will have to protect themselves. From themselves. 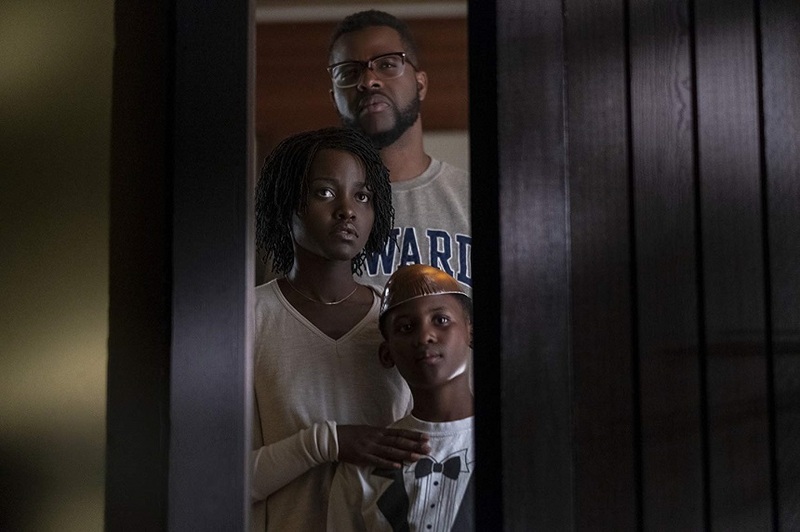 Jordan Peele’s sophomore effort, Us, is another solid horror showing, continuing to solidify the writer and director’s reputation for delivering top shelf, entertaining horror flicks. Us explores our duality, that good and evil are within us all, and what happens if it goes unchecked? Peele has crafted a film that feels classical in its approach. Too some, Us may feel that it has more in common with the type of horror films that came from the nuclear age up to the Cold War, horror films that sought the enemy within. Us goes against the grain of populist horror cinema. Where the majority of mainstream, even indie horror films aim to shock and horrify Peele is a director that would rather quietly creep you out. Not without its moments of violence meant to bring about that shock Peele still keeps viewers at a distance. Very little violence happens up close or even directly in front of the camera. Pay attention to the background, to what is out of focus, because that is where Peele likes to hide his monsters. Lupita Nyong'o and Winston Duke are terrific as Adelaide and Gabe Wilson. Nyong’o is also damned incredible as Adelaide’s doppelganger, Red. The red jumpsuits and golden shears are already destined to be next Halloween’s top costume. The real test will be to see if you can copy her raspy coughed up dialogue. There is one fleeting moment in the climax where I had to stop and take inventory because I got lost in who was who in their standoff exchange. Truly you will pause as well and have to remind yourself that this is the same person playing a second character. We will be talking about this performance at the end of the year when it comes time to mark excellent performances in film, but because this is a horror film will anyone else be listening? And as reaction to horror is subjective, reaction to the horror is Us will be the same. This is not an act of bravado but there was nothing in Us that made me jump out of my seat. Rather, the real strength of Us is that the ebb and flow of Peele’s carefully crafted narrative quietly draws you in, but like the undertow, it quickly pulls you under with ‘shear’ moments of terror. I will reiterate that Us is a damn entertaining horror flick. Peele does not hesitate to start off from the hop with chills and thrills, then maintains the creepiness all the way throughout his film. Us also suggests - putting that mildly - a socio-political message here. There is difficulty addressing this theme, not because of sensitivity, but at the risk of giving away part of the end. There is a reason that Adelaide’s doppelganger Red says, “We are Americans”, when they first break into the Summer home. Indeed Us comes out at time when people groups at all corners are dealing with evil that we thought we may have moved past from, only to see that it has been lying dormant, risen again with no push back from some regimes. Peele garnered attention in the mainstream came with the popular sketch show partly bearing his name. His move into horror should not have surprised fans of that show as it often delved into dark and creepy territory. What caught me by surprise while watching Us is how much humor Peele has written into his screenplay. First he uses it to endear us to the Wilsons as they settle into the summer home. As his story progresses though he uses humor to deflate and disarm the high tension moments, going as far as using gangster rap as a punchline. It is a marvellous moment. Peele relishes mood and atmosphere over in your face exploitations. If you have been weaned on only the most extreme examples of horror you need another lesson in how to horrify through subtlety and with silence. Us needs to be on your personal syllabus. This may not be the horror film you want but it is the horror film you need to expand your horror vocabulary.